My name is Jeff Stoeger of O2BFISHN Guide Service. I would like to thank you for visiting my web site and hope that it is easy to follow and to use. I love to fish and I have a great passion for the outdoors. After 35+ years of fishing and taking hundreds of friends out fishing, I thought it was time for a new adventure in my life as Im making plans for my retirement. I’ve donated countless fishing trips to nonprofit organization and to local high schools for fund raising events. Since I love fish and I like taking people out fishing, I thought that maybe I could make a go at guiding professionally. I have done some guiding in Alaska on the Togiak River some years back. I fish all the following rivers, Sandy, Clackamas, Wilson,Trask and Kilches Rivers for over 35+ years and I’ve had some great success on all these rivers. My goal as a guide is to offer you a trip that would have you feeling more than satisfied at the end of the day. I hope that my work ethics and dedication to making your day on the river, was one that was enjoyable and Relaxing. If I did my job well, I hope that you would come back as a repeated client for years to come. St Croix Rods,Okuma Reels, Owner Hooks, TUF- Line, P-Line, Yakima Bait, Pro-Cure Scent. WOW!!! I had the opportunity to take a trip on Sandy with Jeff as a guide. Jeff knows his business, worked the boat like a seasoned Pro. Weather was crappy to say the least, however, Jeff made the experience one of a kind. He is a very knowledgeable fishing guide as well as historian regarding the local area. Can’t wait to go again as soon as I can. Jeff puts in the effort to make sure you’ll have a great time. He is warm, easy-going, engaging and knows his fish. I highly recommend his services. Steve I was sure hoping to put you and Eric on some fish. They were there, but didn’t get a taker. I enjoyed your company and I sure wished that you and Eric could’ve hooked up. I hope that I can get you and your son out later for some winters steelhead or maybe some springer action later in the year. I have known Jeff for many years both as a friend and fellow fisherman. You will not find a more dedicated personable guy to fish with. Jeff’s fishing knowledge comes from years of experience fishing local rivers for both steelhead and salmon along with his dedication to fish conservation through his association with the Sandy River Chapter of the Northwest Steelheaders. Jeff knows his stuff and will work hard to put you on some fish……. Book a trip, you won’t be disappointed……. Have fished with Jeff it least two dozen times and we didn’t catch fish twice.Great friend and guide I highly recommend a trip with him.Extremely knowledgeable and very easy going,also with a good since of humor.Each trip you will learn alot and at the end of the day be a better fisherman. Took a trip on the Sandy River last week with Jeff. Had a great time. Jeff knows the river very well and is an excellent guide. He knew where to go and what to fish with. Very personable guy that can handle a boat and pole very well. If he ever wanted to he could be a chef……what a great lunch! He also taught me a lot, thanks again Jeff and look forward to another trip. Thanks for the kind words Tim. I enjoyed your company and hope to see you soon. I recently had the opportunity to take my wife on her first drift boat trip with Jeff as our guide. He masterfully put us on fish all day while keeping us entertained with his great personality and fantastic culinary skills! Top notch gear and a super comfortable and stable Clackacraft drift boat made for a perfect day on the river. He was fully equipped with 12 rods (!) 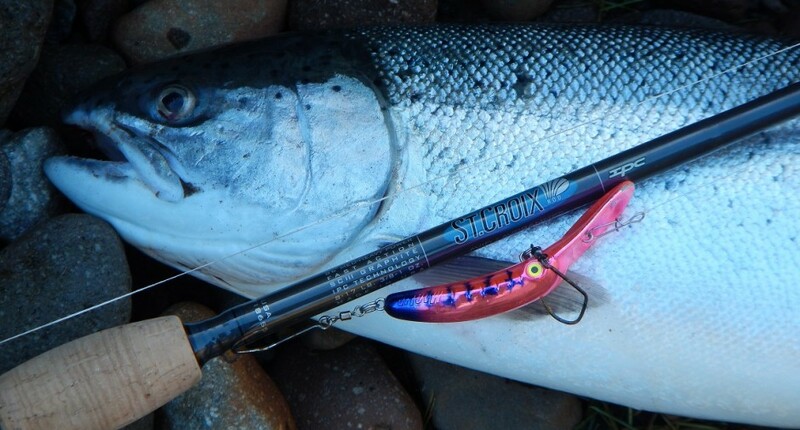 to target Salmon and Steelhead with a variety of techniques. The only thing missing was Sturgeon gear….but we caught one anyway!! Jeff’s instructional nature comes across sincerely, his confidence (very important!) and river knowledge gave us plenty of chances to get into fish. My wife landed her first Steelhead and first Sturgeon on this trip, making for a super memorable day! Fishing with Jeff is like spending the day on the water with one of your fishing buddies. Can’t recommend him highly enough. Get out there with Jeff!! Thank you Dave and Teresa for the kind words. I really enjoyed the day and your company and was glad that we caught fish. Its not every day when your one fish away from the trifecta. I was hoping to get that first springer to make our day. Hope to see you in the future. An awesome day on the river with my wife and Jeff. We went 3 for 3 on the fish with one nice hatchery keeper. The conversations were great, the food was great and the company and knowledge of fishing the Sandy River second to none. Jeff is very knowledgeable and easily approachable with questions. Learn why my bobber doggin was not catching any fish in past years and hooked two nice fish with this technique. Would recommend Jeff to anyone who wants to catch fish on the Sandy River and have a great time doing it. We will definitely do this again. Thanks Jeff!!! My dad and I recently spent a fantastic day on the Sandy River with Jeff. The river was fantastic; very scenic with appearances by bald eagles, redtail hawks, ravens, geese and ducks along the way. We hooked five steelhead and landed three of them all beautiful wild fish released unharmed. I got to fish beads for the first time. It was a great confidence builder trying a new method with the right gear and mentoring by Jeff. Jeff even cooked us up a BBQ lunch on a nice sandy beach. I’ve fished with multiple guides before and I can tell Jeff is special. I would definitely recommend Jeff to friends and family! Great time and great memories.